First of all, THAT ENDING KILLED ME. Second of all, THIS BOOK KILLED ME. I am honestly in shock that this a debut novel because of its pure perfection. I have not read a book that I have fallen so immensely in love and I am so glad I read this. This was phenomenal. I am in awe. First of all, Ahdieh’s writing is beyond words. The way she writes is with such ease and it flows like poetry. I was completely captivated by her words and her story. I seriously could not put this book down, nor did I want it to end. I just finished and I can already feel a book hangover coming until I get the sequel into my hands. What I really enjoyed about this book was the retelling of A Thousand and One Nights. 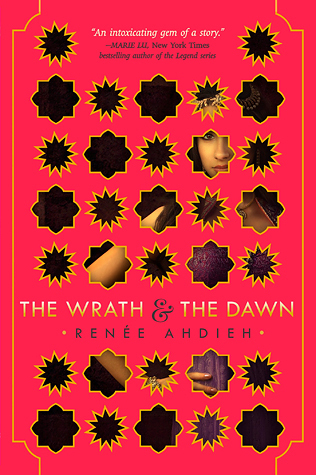 I have never heard of this story before but I was intrigued when I found out this was a retelling so I immediately how to do research before reading this book and I have to tell you, the way Ahdieh incorporates this story with the tale is just fantastic. I absolutely loved it. I was so enthrawed within the stories Shazi told Khalid and every story inside the novel in general. I felt like I was there. I could see everything so clearly and felt everything down to my toes. If that’s not amazing writing then I don’t know what is. Her world is absolutely gorgeous and captivating. I enjoyed this world and look forward to learn more about Khorasan and the magic within. Shahrzad was definitely my favorite character, aside from Khalid obviously, because of her “silver tongue” and strength. She was not afraid to speak her mind and would not bow down to anyone. She is determined to exact revenge on the one who killed her best friend but as her defenses are taken down she sees that Khalid is not all that he appears to be. She loves so deeply and it’s what makes this love story between these two so epic. This book also has some great friendships. I loved Shazi’s growing friendship with Despina and Jalal. Jalal also has an interesting relationship with Khalid because they are cousins and it’s so sad to see Jalal try to get Khalid to open up to him even though he resists so greatly. I can’t wait to see their relationship grow stronger as well. Overall, this book was amazing. I am already looking forward to reading it again! I think it’s definitely my new favorite book of 2015. High Praise! I’ll have to move it up in my TBR.